LIVERMORE, Calif.— Researchers at Sandia National Laboratories have confirmed the particle-by-particle mechanism by which lithium ions move in and out of electrodes made of lithium iron phosphate (LiFePO4, or LFP), findings that could lead to better performance in lithium-ion batteries in electric vehicles, medical equipment and aircraft. The research is reported in an article entitled, “Intercalation Pathway in Many-Particle LiFePO4 Electrode Revealed by Nanoscale State-of-Charge Mapping” in the journal Nano Letters, 2013, 13 (3), pp 866-872. Authors include Sandia physicist Farid El Gabaly and William Chueh of Stanford University. 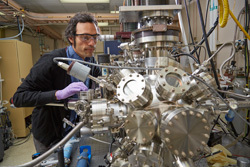 Sandia National Laboratories physicist Farid El Gabaly aligns a lithium-iron-phosphate battery electrode sample for chemical characterization with X-ray photoelectron spectroscopy. The samples will then be thinly sliced for state-of-the-art synchrotron X-ray microscopy. (Photo by Jeff McMillan) Click on the thumbnail for a high-resolution image. While LFP material is intriguing to researchers and battery manufacturers for those reasons, the process by which lithium ions move in and out of LFP as the battery stores and releases its energy is not well understood. This has proven to be a barrier to the material’s widespread adoption. Cathode materials like LFP are critical in the search for higher-capacity, long-life, lithium-ion batteries for applications where batteries can’t be replaced as easily or as often as they are in consumer electronics. Larger applications where lithium cobalt oxide cells eventually could be replaced by LFP batteries include electric vehicles and aircraft. 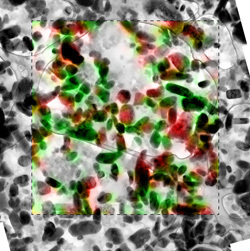 Previous attempts to optimize the charging/discharging speed have included coating the particles to increase their electrical conductivity and reducing particle size to speed up their transformation, but have overlooked the initiation process that may well be the critical rate-limiting step in the way that lithium moves from a particle’s exterior to its interior. 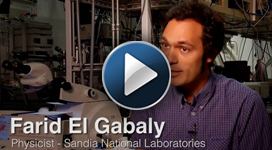 Sandia National Laboratories physicist Farid El Gabaly explains the need for a new kind of material in lithium-ion batteries, particularly for larger applications, and how lithium iron phosphate might be the solution. Watch a second video describing Sandia’s technical approach to analyzing the material. Lithium ions move in and out of battery electrode materials as they are charged and discharged. When a rechargeable lithium-ion battery is charged, an external voltage source extracts lithium ions from the cathode (positive electrode) material, in a process known as “delithiation.” The lithium ions move through the electrolyte and are inserted (intercalated) in the anode (negative electrode) material, in a process known as “lithiation.” The same process happens in reverse when discharging energy from the battery. “Our discovery was made possible by mapping the lithium in a relatively large particle ensemble,” he said. LFP particles as seen by a transmission electron microscope with overlay of the chemical information as seen by a scanning transmission X-ray microscope. The red represents lithium iron phosphate while green represents iron phosphate, or LFP without lithium. (Image courtesy Sandia National Laboratories) Click on the thumbnail for a high-resolution image. The researchers were able to build a commercial-grade coin-cell battery from raw materials using Sandia’s cell battery prototyping facility in New Mexico, which is the largest Department of Energy facility equipped to manufacture small lots of lithium-ion cells. The battery was then charged, tested for normal behavior, and disassembled at Sandia’s Livermore, Calif., facility through a new method of slicing layers that conserved the spatial arrangement from the cathode to the anode. 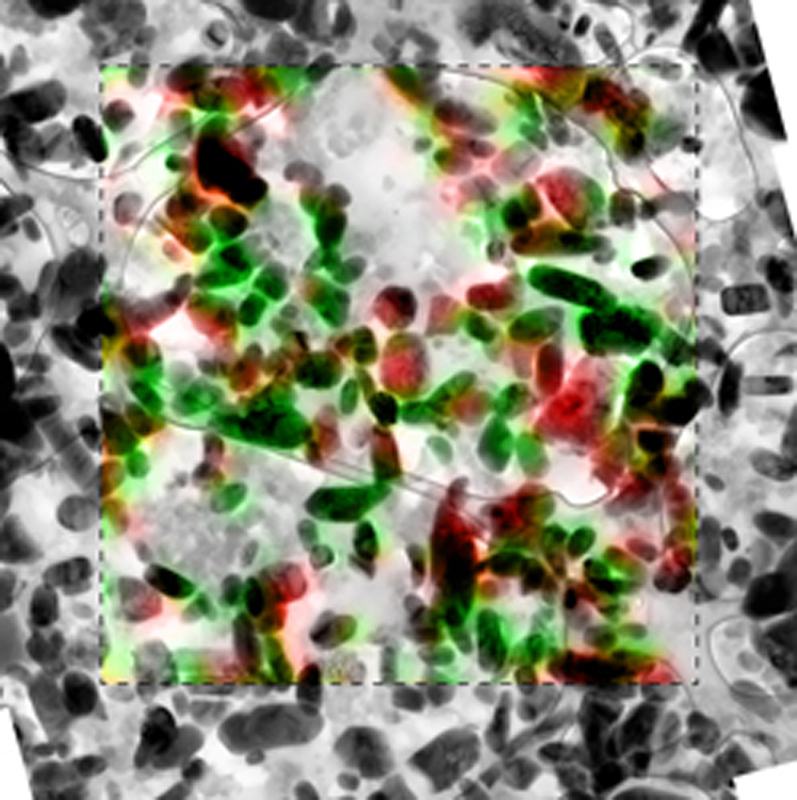 The Sandia researchers went to Lawrence Berkeley National Laboratory to characterize the materials with state-of-the-art scanning transmission X-ray microscopy (STXM) at the Advanced Light Source (ALS), and then returned to Sandia’s California site for study by transmission electron microscopy (TEM). “The X-ray spectroscopy from the ALS tells you what’s inside an individual particle, or where the lithium is, but it has low spatial resolution. We needed the electron microscopy of the same slice to tell us where all the particles were distributed across the entire layer of the battery,” said Chueh, a former Sandia Truman Fellow who is lead author of the journal article and an assistant professor and center fellow at the Precourt Institute of Energy at Stanford University. Sandia’s research team and others presented their technical findings at the recent Materials Research Society Spring Meeting in San Francisco. As a result of that presentation, El Gabaly said, other researchers are using the results to validate theoretical models. The team also may partner with industry, as one company has already indicated a strong interest in Sandia conducting similar studies on different, more complex battery materials. The research team at Sandia has been funded internally, including support from the Sandia Truman Fellowship in National Security Science and Engineering, and by the Department of Energy’s Office of Science, which also supports the ALS.